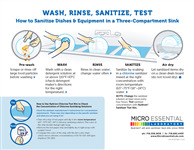 As part of Micro Essential Laboratory’s commitment to Food Safety, we are happy to offer these instructional posters as free downloads. Please click on the links below to download the posters. Each poster describes the correct procedure for using a 3-compartment sink to ensure proper sanitization and adherence to FDA food safety guidelines. These posters are also available for a nominal charge in full color, printed on a self-adhesive paper. Of course, we also offer a variety of sanitizer test papers that make testing your sanitizers easy.